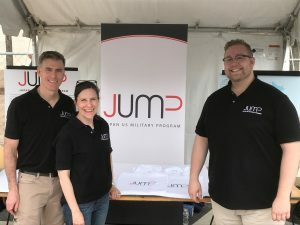 JUMP Director Chris Rodeman, Communications Manager Susan Dalzell, and Program Assistant Troy Robinson spent the day greeting JUMP members and introducing the program to festival visitors. On Saturday, April 13, JUMP hosted a booth at the Sakura Matsuri on Pennsylvania Avenue in Washington, D.C. 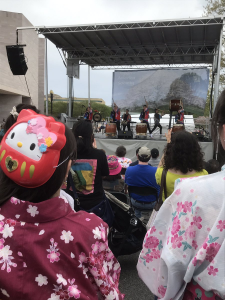 The Sakura Matsuri is the largest Japanese cultural festival in the United States and features many Japanese-interest groups, food vendors, and performances. The Cherry Blossom Festival itself is a celebration of the 3,000 cherry blossom trees the mayor of Tokyo gifted to Washington, D.C. in 1912. The booth gave JUMP staff a great opportunity to talk to potential or current JUMP members face-to-face and hear about their experiences in Japan. Many stopped by with their families to discuss their memories from when they were stationed in Japan and to learn about ways to become more involved. Visitors were encouraged to follow JUMP on Twitter, Facebook, and Instagram. Events like the Cherry Blossom Festival are a great opportunity for introducing those who served or lived in Japan to programs like JUMP, which brings elements of Japanese culture to the U.S. for those who were once immersed in the culture. JUMP connects past and present service members, families, and government civilians who have served in Japan. If you did not have the chance to see us at this festival, join the JUMP network by signing up for the JUMP Newsletter.